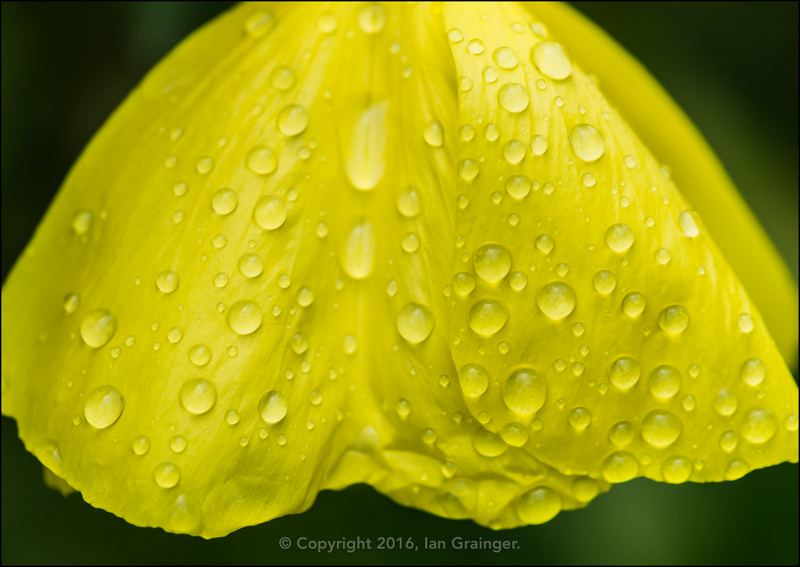 After an extremely dry period of weather, the garden got some much needed rain this weekend. 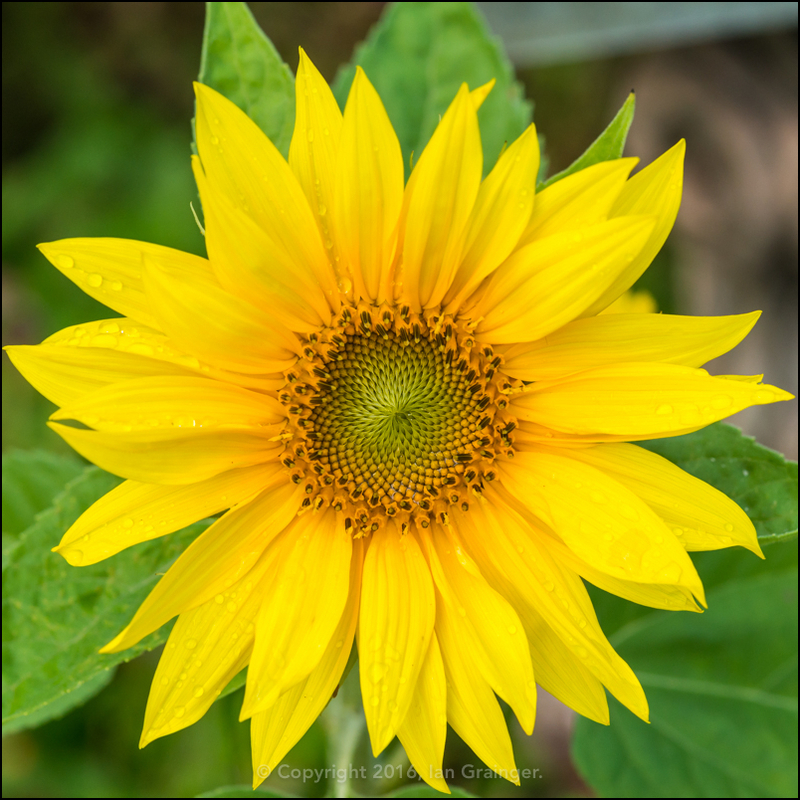 The only downside was that it came during my Sunday morning photo shoot in my dad's garden! 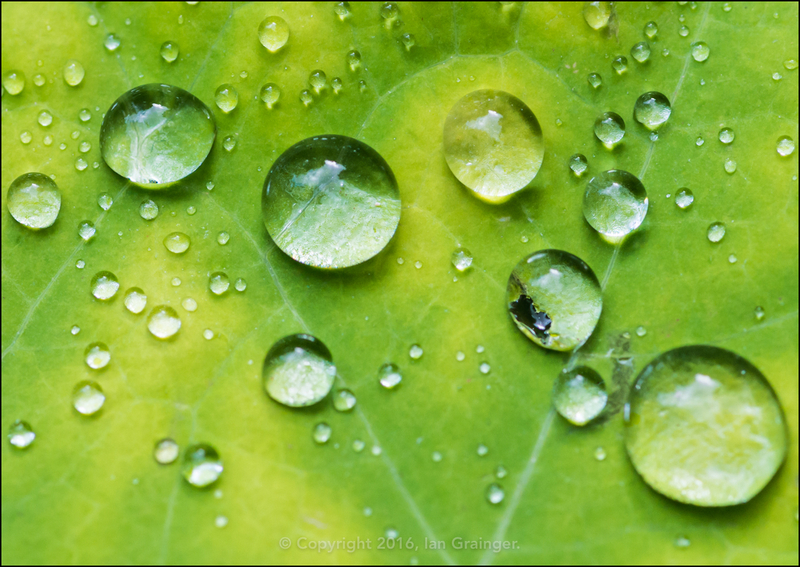 This meant that there was very little chance of photographing insects as they had all stayed home in bed, avoiding the enormous raindrops. 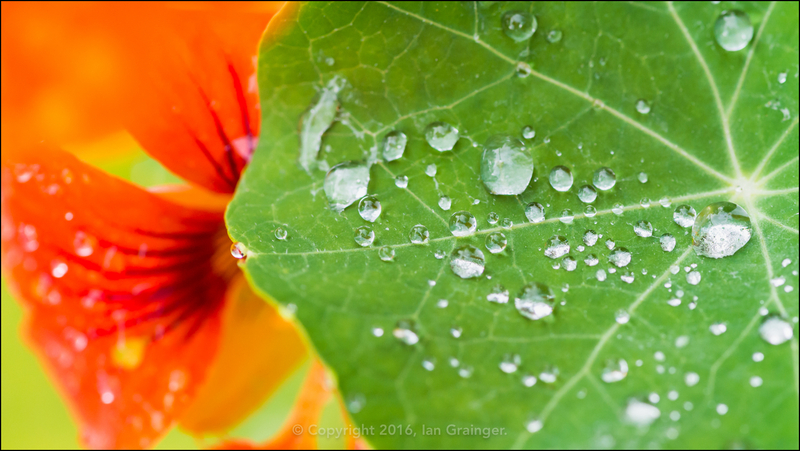 ...and this Nasturtium (Tropaeolum) leaf. 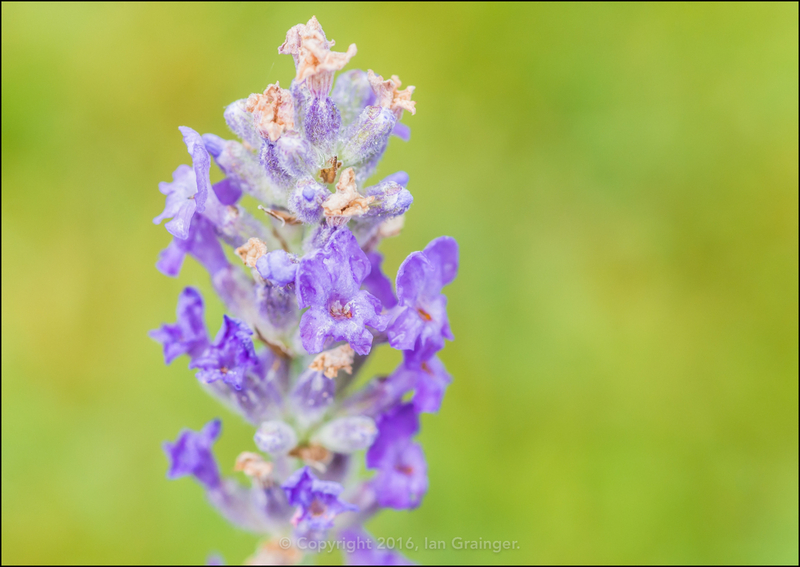 However, it wasn't long before I started to notice signs of summer coming to an end. 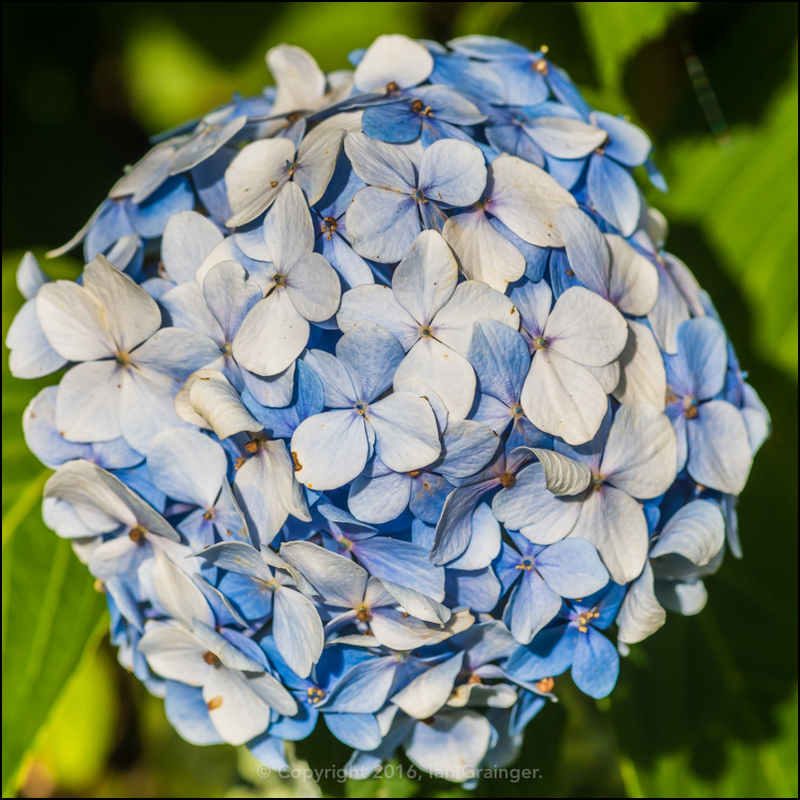 This light blue Mophead Hydrangea (Hydrangea macrophylla), although still intact, had certainly seen better days. 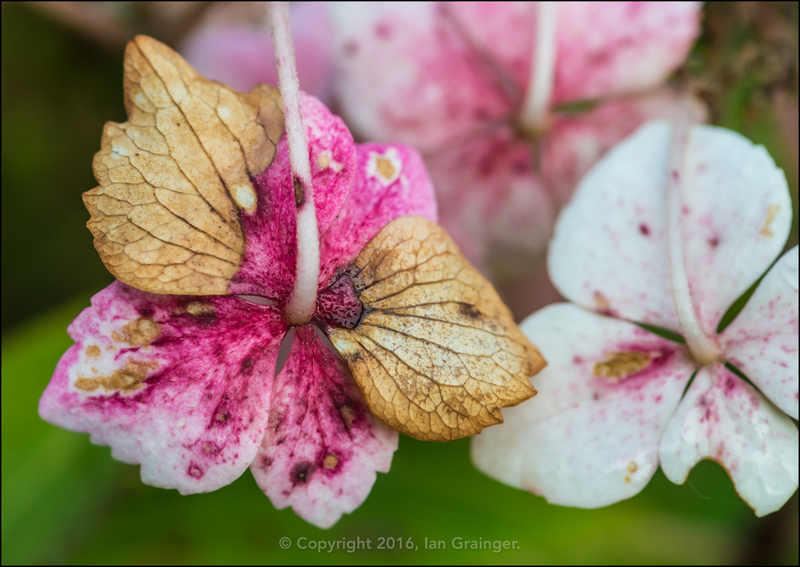 While this Lacecap Hydrangea was already seemingly well into the autumnal part of its life cycle. 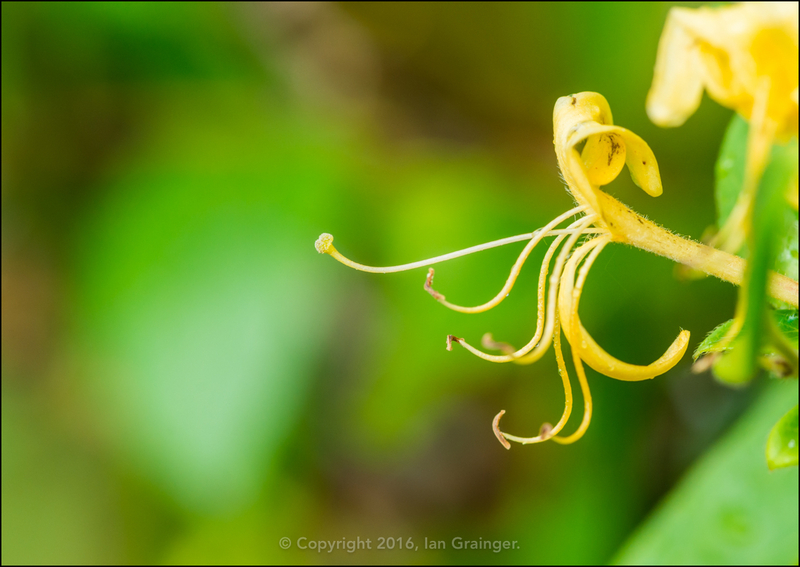 ...as was this Honeysuckle (Lonicera). 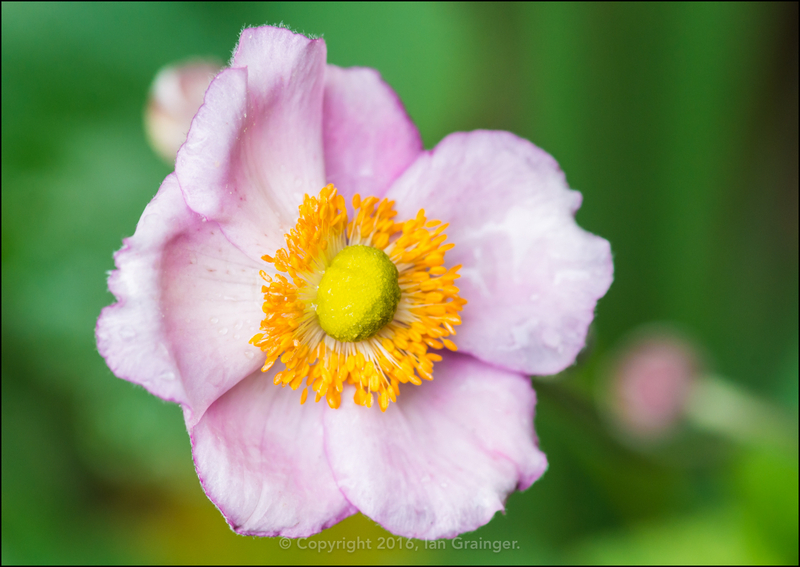 At least the Japanese Anemones (Anemone hupehensis) were flowering at their usual time, and looking quite splendid in a darker corner of the garden. 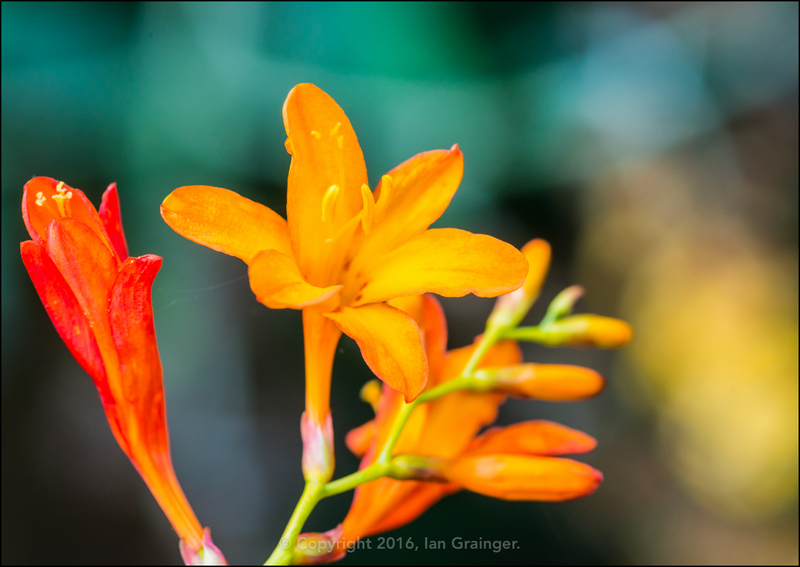 The Montbretia (Crocosmia) was also glowing, despite the wet weather. 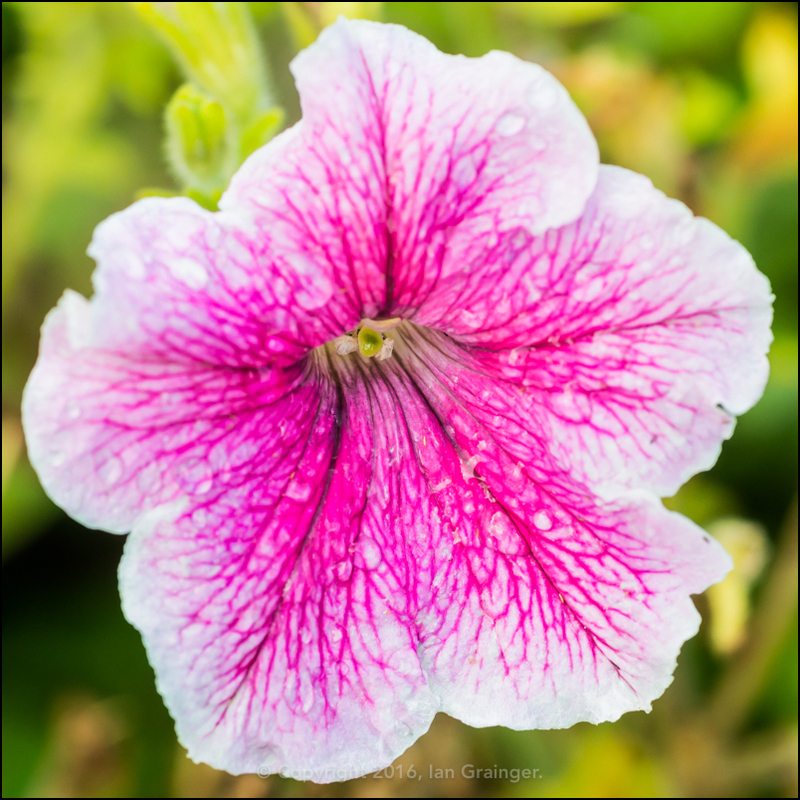 ...as were the pink Petunias, which had flowered continuously since the end of May. 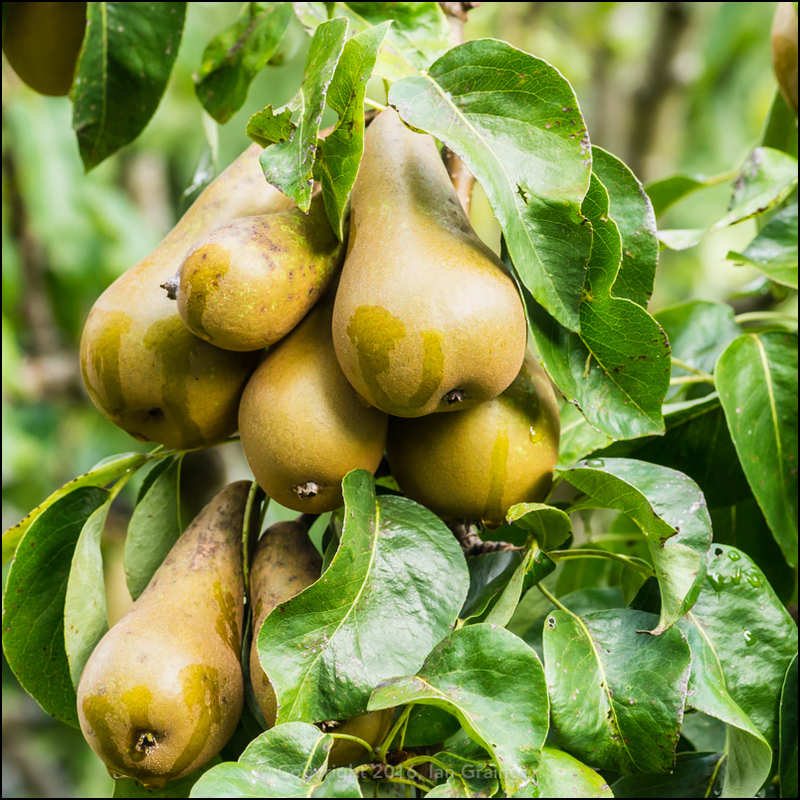 The Pears were coming along nicely, in a garden adjacent to dad's, with this particular tree having hundreds of ripening fruits. 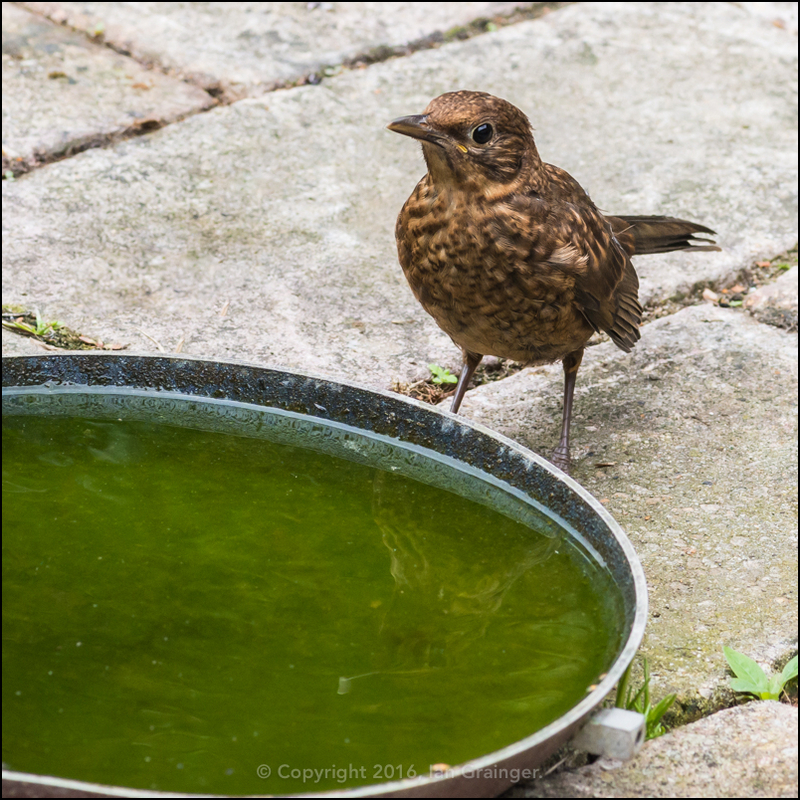 The juvenile Blackbird (Turdus merula) that I featured last week was back, and growing even bolder, as it approached an old frying pan full of drinking water. 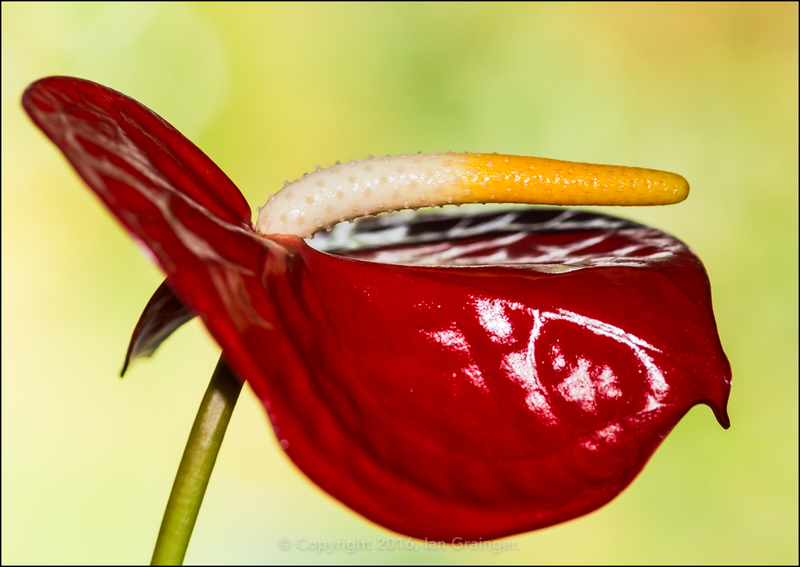 As the rain came down heavier, it forced me indoors, where this Flamingo Flower (Anthurium) caught my eye. 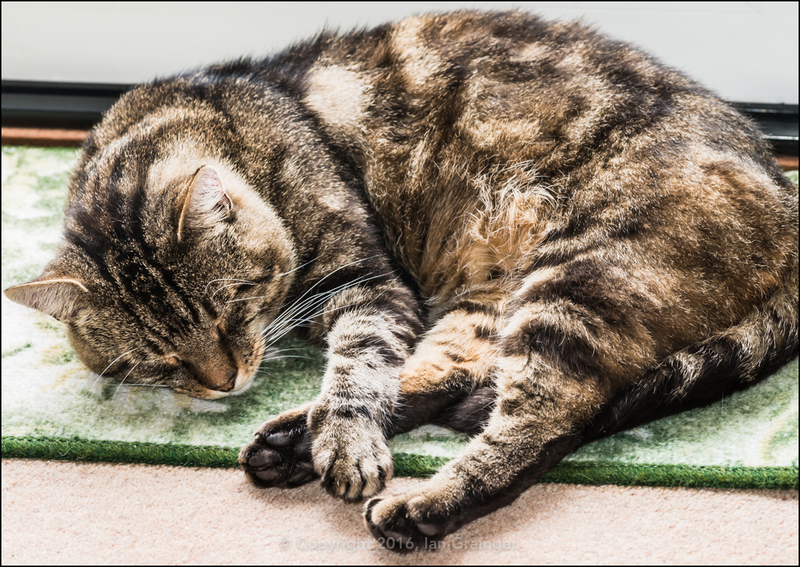 My usual photo shoot companion wasn't impressed at all by the wet weather this week, and while I spent the morning dodging raindrops, he instead opted to have a quiet snooze on his favourite mat. 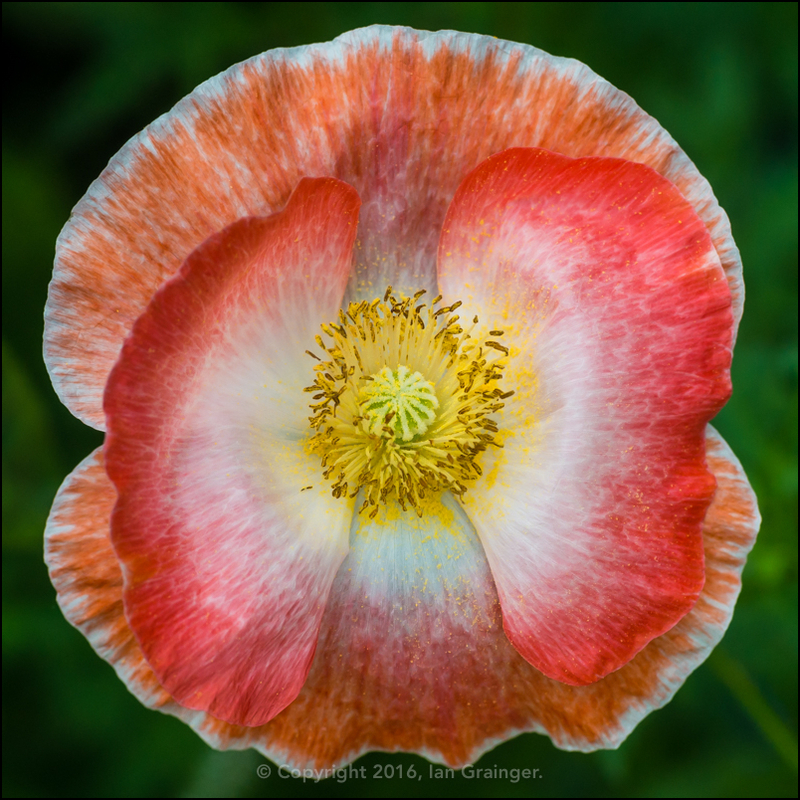 Back in my garden this week, I had a plethora of new blooms reporting for duty. 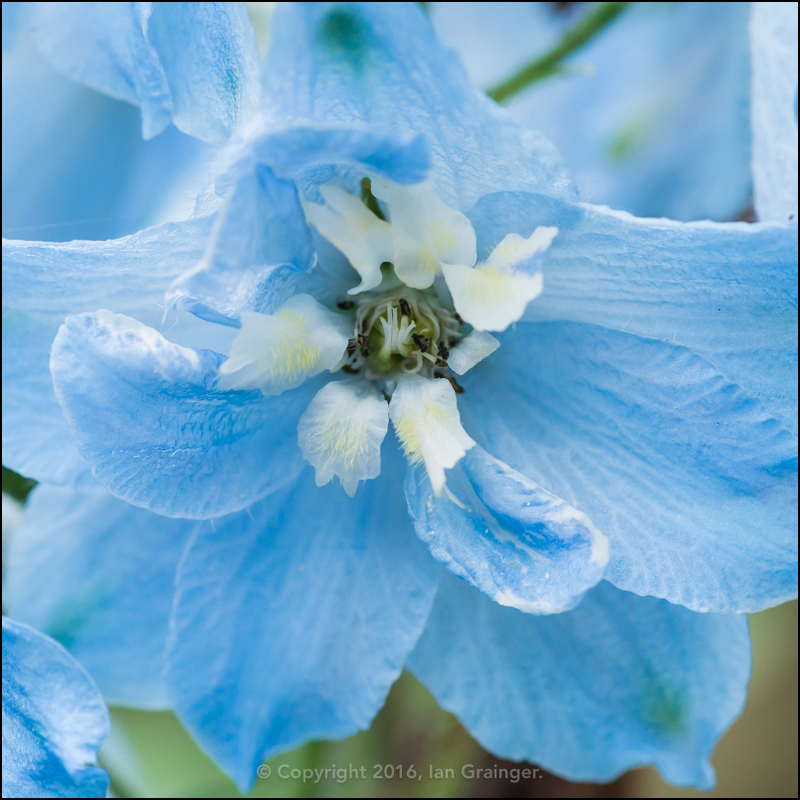 My favourite of which was this light blue Delphinium (also known as Larkspur). I was not expecting them to flower this year as I only purchased them as small plug plants a couple of months ago. 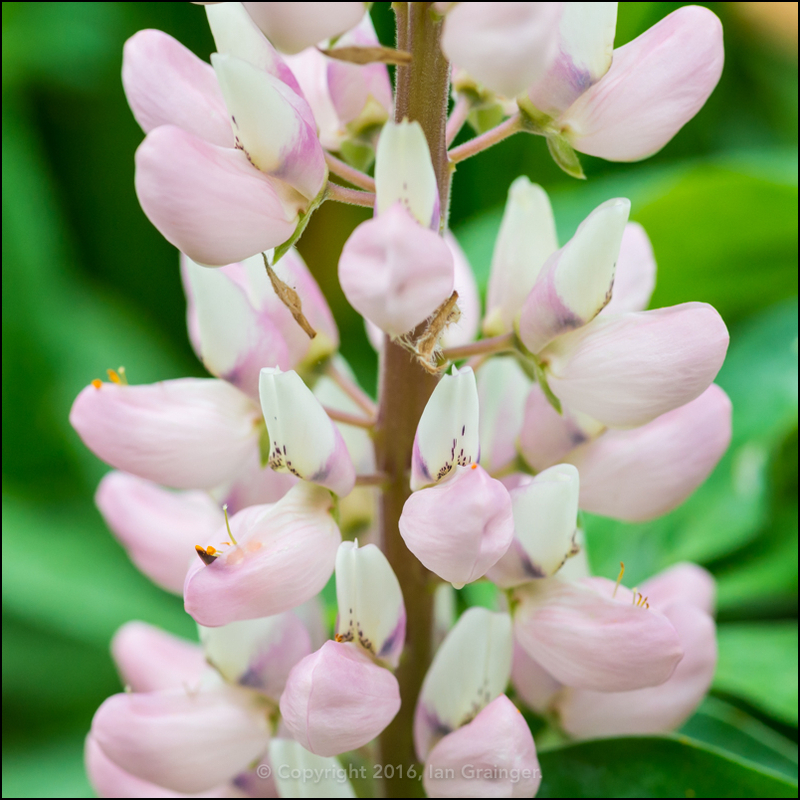 The Lupins (Lupinus) were purchased at the same time, and were also not expected to flower this year, but I'm pleased that they have. 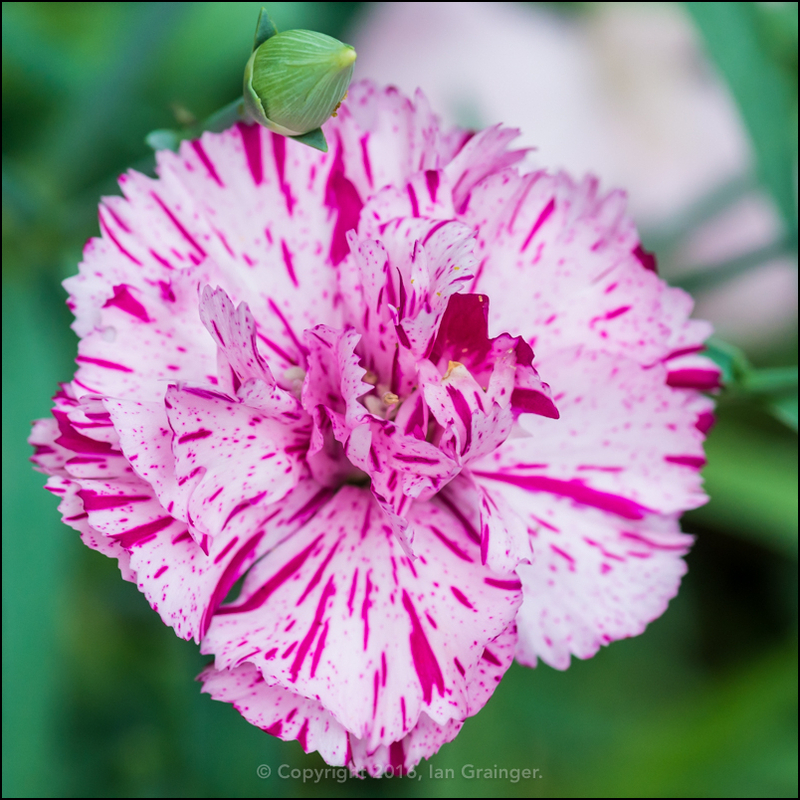 The Carnations (Dianthus) have started flowering this week, and this mottled pink coloured one was my favourite to open so far. 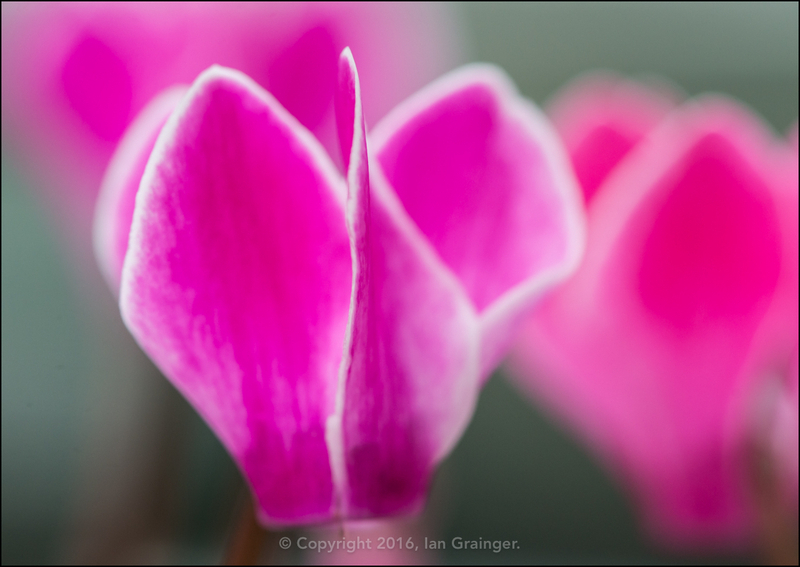 I couldn't resist purchasing some Cyclamen when I visited the garden centre earlier in the week. 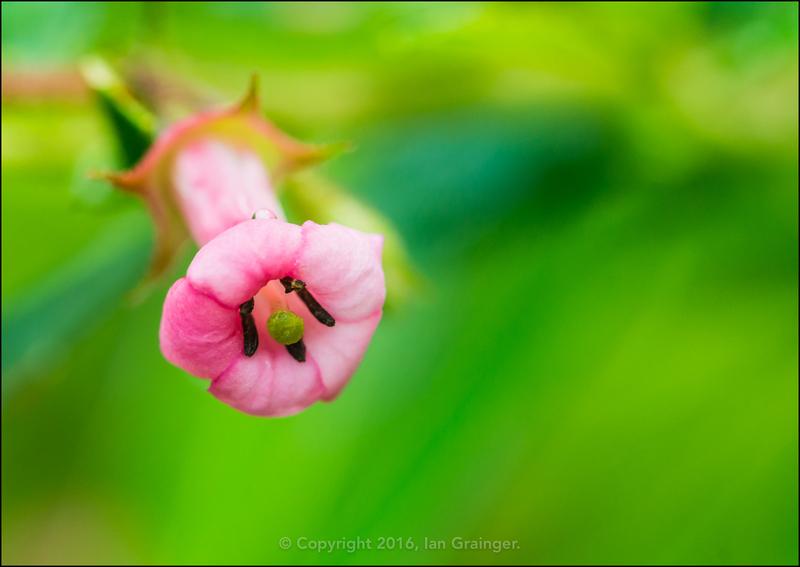 Hopefully they will bring some colour to the garden all through the autumn and winter. 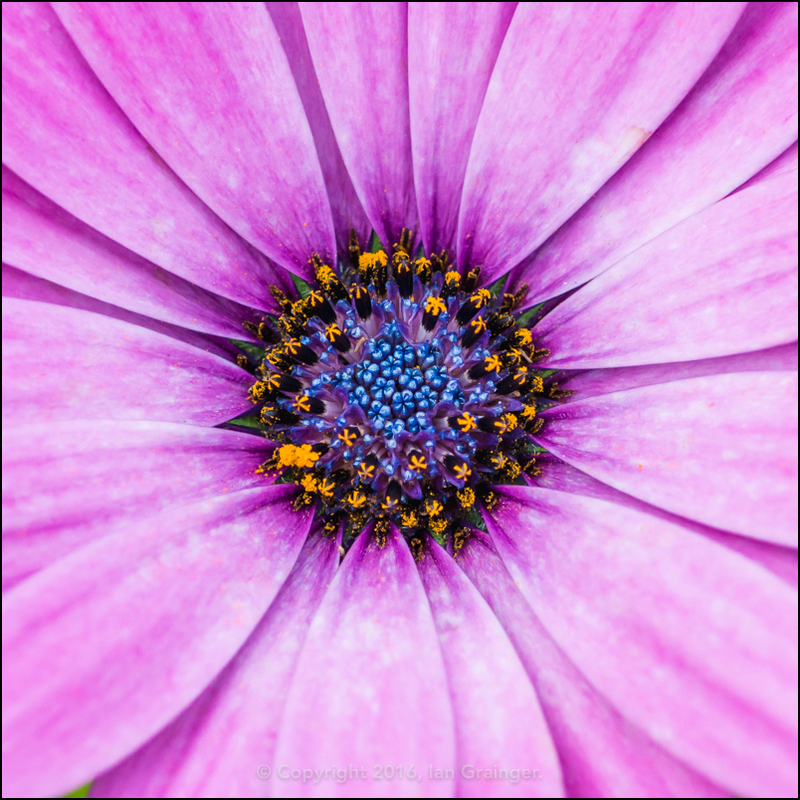 ...as have the African Daisies (Osteospermum) this year. They've been flowering since late spring, and show no signs of stopping. 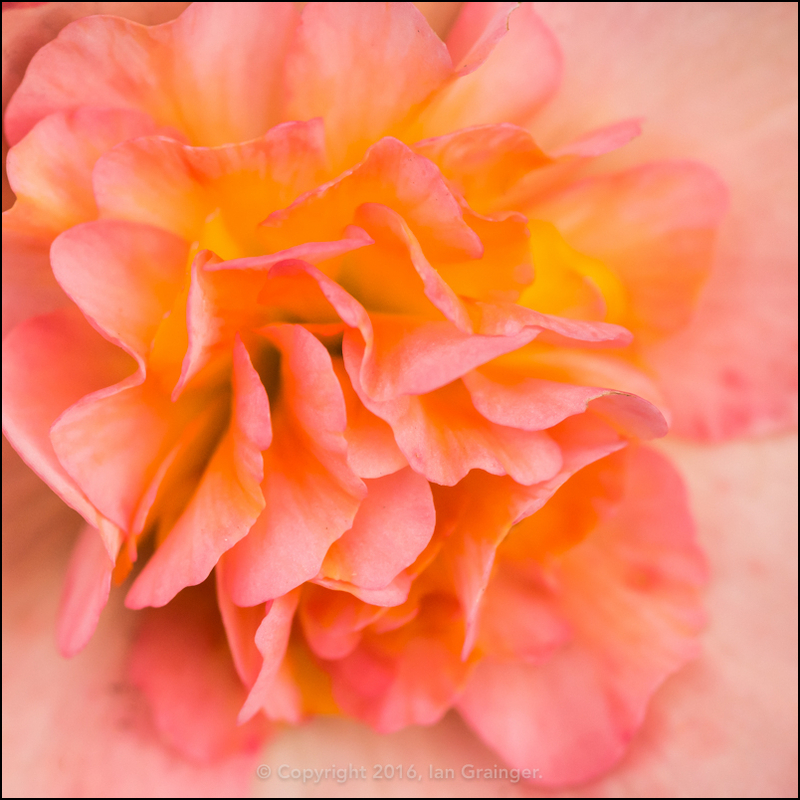 Finally, the Begonia 'Illumination' was living up to its name this week, looking quite beautiful in the warm summer sunshine.